Geoffrey Paul Barrow (born 9 December 1971) is an English music producer, composer, disc jockey, and is the instrumentalist for the band Portishead. Barrow is also a member of the band Beak and hip-hop supergroup Quakers, in addition to his work as a film score composer. Portishead—formed in 1991—was named after the small coastal town near Bristol where Barrow grew up. 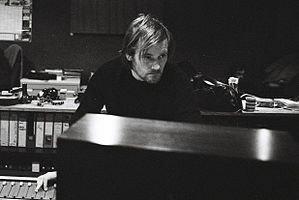 On his intentions in forming Portishead, he has stated, "I just wanted to make interesting music, proper songs with a proper life span and a decent place in people's record collections." Born in Walton in Gordano, Somerset, Geoff and his mother moved to the town Portishead when he was eleven, after his parents divorced. After being involved in many local rock bands, playing drums and DJ'ing in hip hop groups, Barrow got his first job at the Coach House Studios as a tape operator soon after it opened in 1989. In 1991, while he was assisting on Massive Attack's breakthrough album Blue Lines, the band allowed him spare studio time to get his own ideas on tape. A few years later, when the Portishead project had been assembled, the group came back to record "Sour Times" in that same studio. At the dawn of the '90s, Barrow was making a name for himself as a remixer, working with such artists as Primal Scream, Paul Weller, Gabrielle and Depeche Mode. In addition, Barrow had produced a track for Tricky and written songs for Neneh Cherry. In 2001, he formed the Australian record label, Invada Records (whose artist roster includes acts such as RuC.L and ARIA-award-winning group Koolism), together with Katalyst's Ashley Anderson. In 2003, Barrow set up Invada UK, a more experimental music label with partner Fat Paul, signing bands such as Gonga, Team Brick, Atavist, Joe Volk, malakai and Crippled Black Phoenix. As "Fuzzface", Barrow co-produced and co-wrote Stephanie McKay's 2003 debut album, "McKay", featuring songs co-penned by Tim Saul and Carl Hancock Rux. He has also remixed songs for both Gravediggaz and The Pharcyde. In 2005, Barrow, along with Adrian Utley, produced The Coral's third album, The Invisible Invasion. He and the other members of Portishead recorded and released an album in April 2008, titled Third. In 2009, Barrow produced The Horrors' second album Primary Colours with Craig Silvey. Another Barrow project is Beak with Billy Fuller (Fuzz Against Junk) and Matt Williams (Team Brick). Their self-titled album was released in 2009. In 2010, Barrow met a political journalist who shared the same musical vision and a week later she, Barrow, Fuller and Williams begin recording material. After twelve days, using one room, no overdubs or repair, and only edits to create arrangements, they produced Anika's self-titled debut album Anika, and its lead single "Yang Yang", released 17 November 2009 on Barrows' Invada and on Stones Throw Records in USA & Japan. Barrow was the music supervisor for the Banksy film Exit Through the Gift Shop, premièred at the Sundance Film Festival on 24 January 2010, and released in April 2010. In early 2012, Barrow's new hip hop project Quakers was announced to be releasing an album on Stones Throw Records. He also formed the musical project Drokk with TV composer Ben Salisbury and released the album Drokk: Music inspired by Mega-City One from the movie Dredd. On 2 July 2012, Barrow, Billy Fuller and Matt Williams released their second Beak album on Invada Records. In 2013, Barrow collaborated again with Ben Salisbury on the score for the Alex Garland film Ex Machina. They also worked together on 2018's film Annihilation. In 2016, he scored the Ben Wheatley film Free Fire. On 20 September 2018, Barrow, Billy Fuller and Will Young (who replaced Matt Williams) released their third Beak album on Invada Records. 1992 Homebrew Neneh Cherry Co-writer and co-producer of "Somedays"
Meow the Jewels Run the Jewels Remixing of "Close Your Eyes and Meow to Fluff"
2017 Everything Now Arcade Fire Additional production, synthesizer on "Creature Comfort"
^ a b c Simpson, Dave (11 April 2008). "Profile: Geoff Barrow". The Guardian. Retrieved 23 August 2009. ^ "Portishead Biography". NME. Retrieved 23 August 2009. ^ "Geoff Barrow". Discogs. Retrieved 23 August 2009. ^ "Geoff Barrow forms new band". Line of Best Fit. Archived from the original on 25 August 2009. Retrieved 23 August 2009. ^ Phares, Heather. "Anika". Allmusic. Rovi Corporation. Retrieved 5 March 2011. ^ "Announcing: Quakers". Stones Throw Records. Retrieved 20 February 2012.